A batch of these soft rolls makes three dozen, and they freeze very well. They are the perfect size for a toddler sandwich, a 1/4 pound burger, a dunk for soup, or a treat with butter and honey. If sliced thinly, they make four slices for crispy toast. Dissolve the sugar and yeast in the cup of warm whey. Allow to stand for 10 minutes. In a large bowl, combine the rest of the whey and sugar and olive oil. Stir in the yeast mixture. Add the flour, one cup at a time, until a soft dough is formed that does not stick to the bowl. Turn out the dough onto the counter and knead for 8-10 minutes, working in as much of the flour as possible. Pour about a tablespoon of oil into the bottom of a clean bowl. Shape the dough into a ball, and turn the ball around in the bowl, coating one side well with oil. Flip it over, oil-side-up. Cover the bowl with a clean tea towel and allow the dough to double, 45 minutes to an hour. Once doubled, punch dough down and let it double again. Once doubled again, punch it down and divide it into into thirty-two small balls of dough. (The fastest way to do this is to twist the dough into two, then each half into two quarters, the quarters into eighths, the eighths into sixteenths, and the sixteenths into thirty-seconds. ) Take each little chunk of dough in your hand, and form a ball by pushing the dough into the center of itself with your thumbs, making it smooth on one side. Pinch the other side to seal the ball, to keep the dough from springing out of its shape. Form all thirty-two rolls. 1) Add 1 cup wheat bran. It will still have the manageability of white bread with added fiber. 2) Substitute water for the liquid whey and add 2 tsp of lite salt. 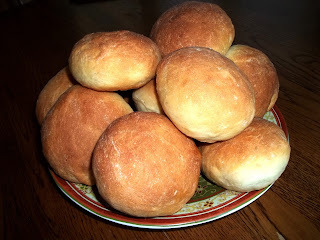 The buns will have about 65mg of sodium each. (There is some sodium in whey and without adding a little back the bread will taste flat.) Store these in the fridge or freeze as they will tend to dry out faster.